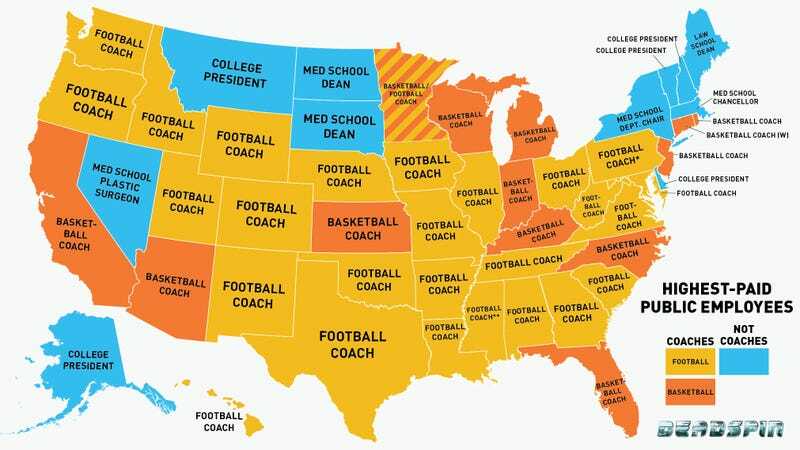 Based on data drawn from media reports and state salary databases, the ranks of the highest-paid active public employees include 27 football coaches, 13 basketball coaches, and 11 dorks who aren't even in charge of a team. So what's the problem then? These guys make tons of money for their schools; shouldn't they be paid accordingly? There are at least three problems. Coaches don't generate revenue on their own; you could make the exact same case for the student-athletes who actually play the game and score the points and fracture their legs. This revenue rarely makes its way back to the general funds of these universities. Looking at data from 2011-2012, athletic departments at 99 major schools lost an average of $5 million once you take out revenue generated from "student fees" and "university subsidies." If you take out "contributions and donations"—some of which might have gone to the universities had they not been lavished on the athletic departments—this drops to an average loss of $17 million, with just one school (Army) in the black. All this football/basketball revenue is sucked up by coach and AD salaries, by administrative and facility costs, and by the athletic department's non-revenue generating sports; it's not like it's going to microscopes and Bunsen burners. But wait. I looked up my coach's pay in a state salary database and he wasn't on top. What gives? Most of these databases include only the coaches' base salaries, which are drawn directly from the state fund. This is how you could be led to believe that Virginia's offensive coordinator earns more than its head coach. Far exceeding these base salaries is the "additional compensation" that almost all of these coaches receive, which is tied to media appearances, apparel contracts, and fundraising. While this compensation does not come directly from the state fund it is guaranteed in the coaches' contracts; if revenue falls short, the school—and thus the state—is on the hook to cover the difference. Plus, even it doesn't come directly from taxpayers, this compensation is still problematic for all the reasons listed above. Beyond salary and additional compensation, coaches earn money from bonus incentives tied primarily to the team's performance. This analysis ignored those bonuses and focused on guaranteed money, as it's impossible to guess at whether a coach will hit his benchmarks. And we're not even touching the ridiculous amounts of money coaches can get if they're fired before their contract ends. * Penn State is technically "state-related" and not truly public, and as a result the school does not receive as much state funding as a typical public school (leading to higher tuition) and does not have to disclose as much information about its employees. You can read the details here. ** It's difficult to track down salary information for employees at Ole Miss and Mississippi State, but the highest non-coach salaries we could find top out at around $500,000. While we can't prove that nobody at these schools earns more than Dan Mullen's $2.65 million per year, we think it's very unlikely.